You are trapped inside a farm house and the door is closed with a hidden key. 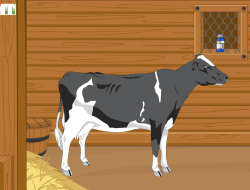 Because no one is near to help you escape, you must solve a series o puzzle to help the cow escape the farm. You must be carefully at every details because every object will help you in this escape game. Solve the mystery and help the cow to escape. You need to use your mouse to solve the mistery. Farm house escape 0.00 between 0 and 10 based on 0 votes.